About Us > E-Newsletter Archive > Are you road-trip ready? The dreaded flat tire: It happens to everyone sooner or later. Ideally, it happens close to home, on a neighborhood road, without a whole lot of traffic. At worst, you're on the highway in rush hour wearing your date-night outfit—you get the picture. 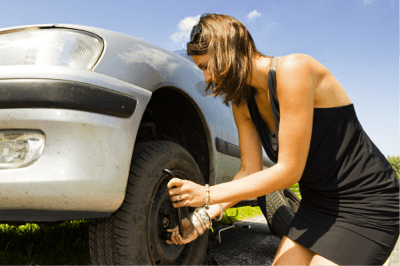 Changing a flat tire is not something most of us look forward to, but knowing the rights steps to take can help you to avoid feeling helpless and unsafe. 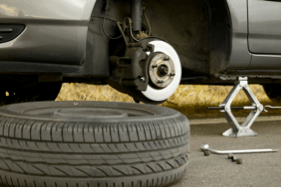 If you get a flat tire while driving, don’t slam on your brakes. Steadily decrease your speed and keep a firm grip on the steering wheel with both hands while you work your way to a safe place off the road. Turn on your hazard lights and set your parking brake. Look around. If you feel unsafe, don’t hesitate to call the police. You should always call 911 if you’re broken down on a narrow shoulder, a slope, or a busy highway. Don’t try to wing it unless you have plenty of room to safely replace your tire. If you’re on any kind of incline, try placing a brick, large rock or other heavy object behind one of the undamaged tires to prevent the vehicle from rolling. Locate your spare tire and tools and set them near your flat tire. Loosen the lug nuts with your lug wrench. Remember: righty-tighty, lefty-loosey. If the lug nuts (those little things that hold your tire on) aren't visible, you probably need to remove the hubcap. Use the flat end of the lug wrench to pry the hubcap off, being careful not to bend it. With the lug nuts now loosened, slide the jack under your car frame and pump or turn the lift. You should only lift the car until the flat tire is just barely off the ground. Be sure to reference your owner's manual for proper car jack placement. Now remove the loose lug nuts and place them in your pocket or other contained space for safe-keeping. Remove the flat tire by pulling straight away from your car. Watch your hands in case the tire is damaged. It may be heavy- make sure you slowly increase your pull to avoid injury. Store the flat tire in your trunk. 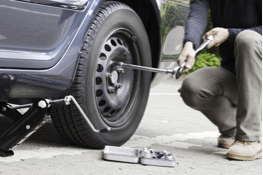 Lift the spare tire onto the now exposed screw prongs (lug studs, studs, or bolts) on your vehicle, lining up the screws/studs/bolts with the holes in the tire. Remember: The air valve on the tire should be facing out. Note: Most spares are not designed for high speeds, so keep your speed under 50 mph (leave your hazards on if needed), and be sure to head back to our shop ASAP – we’re here to help you get back on the road quickly and safely! Screw on the lug nuts by hand until they're all secured. Then tighten them slightly with the lug wrench. Using the jack, lower your car just enough so that the tire can’t spin. Then use the lug wrench to tighten those lug nuts. Lower your vehicle completely and remove the jack. Replace your hubcap if you have one. Unblock your wheel if you followed step 4. If not, you’re all set. Don’t forget to check the pressure of your spare tire a few times a year as they can become underinflated. Print these step-by-step instructions on how to change a flat tire to keep in your glove compartment for reference! Keep a pair of cloth gloves in the trunk with your jack and tool kit for easy handling when changing your flat.